Why Is State Waiting to Release the Saudi Technical Cooperation Agreement? As I noted in this post, one explicit purpose of Saudi Minister of Interior Mohammed bin Nayef’s trip to the US from January 14 to 16 was to renew the Technical Cooperation Agreement first signed on May 16, 2008 by Condi Rice and MbN’s father when he was Interior Minister. 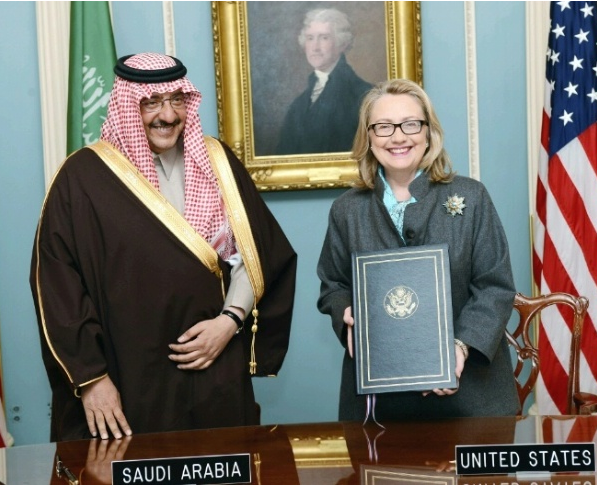 MbN and Hillary Clinton signed the renewal on January 16. Yes, I do plan to keep trying, both through persistence or FOIA. But I am interested in why State wouldn’t post it right away. Perhaps it’s just internal bureaucracy, but here are thoughts about some other possibilities. First, there is a change we know has taken place since the TCA was first signed. The TCA is basically a cooperation agreement to get direct help from us–including training and toys–to protect Saudi infrastructure and borders, particularly its oil infrastructure. As part of it, the Saudis are developing a 35,000 person force, including a paramilitary force, with US training. But unlike our other defense agreements with the Saudis (and like the Joint Commission for Economic Cooperation it was explicitly modeled on, which had been in place from the 1970s until 1999), this one includes a special bank account to fund it all. Now, I’m not entirely sure how innovative it is that the Saudis are funding US hires to defend their oil infrastructure. But MbN’s quip about the lawyers suggests some sensitivity on this front. So at the very least, publishing the TCA renewal will reveal–officially at least–this change in funding. One of the things the Saudis and Americans liked about the JECOR precedent, it seems, is that by setting up an independent bank account, Congress forgot about it, allowing for greater flexibility. JECOR would operate for 25 years, channeling billions of Saudi oil dollars back to the United States, but would attract almost no attention in this country because Congress ignored it. The Saudis were paying for it, so there was no need for US appropriations or congressional oversight. That structure might be even more lucrative given the security focus of this partnership (assuming the public reporting is accurate and JECOR did not include such a focus, about which I’m skeptical). And from before the TCA was signed, the agreement was meant to include weapons sales, particularly helicopters. But I’m not sure whether the toys MbN was requesting have been reflected in Congressional accounts. This Congressional Research Service report from last year acknowledges the TCA and some of its programs. U.S. efforts to support Saudi critical infrastructure protection continue under the auspices of a bilateral agreement signed in May 2008. A Joint Commission on Critical Infrastructure and Border Security Protection serves as the bilateral coordination mechanism for State Department, Energy Department, and Defense Department engagement with Saudi counterparts. Initial joint security assessments have been completed, and U.S. advisory support is being provided on a contract basis via the Office of the Program Manager-Facilities Security Force (OPM-FSF) to the Saudi Ministry of Interior as it implements an initial five year development plan for the new Facilities Security Force. But the list of weapons purchases on the following page doesn’t appear to reflect anything for Minister of Interior or the FSF specifically. That’s not to say they’ve even been identified yet, but I do expect to see weapons sales through this agreement, eventually. Now, weapons are just one of the things the Administration might want to hide from Congressional oversight. Unlike, say, covert ops, Congress does occasionally complain about sales to the Saudis. Nevertheless the scale of any FSF purchases would be small in comparison to the other big recent Saudi purchases approved. What really has my spidey sense tingling is the funding structure here: a bank account set up to fund what our counterterrorism liaison, MbN, deems critical to defend the oil fields (located among Saudi Arabia’s restless Shia minority) or borders (where the Saudis have attacked Houthis and other Yemeni insurgent groups, or where the Saudis have helped Bahrain brutally defend against its own insurgency). The entities against which MbN would be defending Saudi infrastructures (and borders) are precisely the ones we’re partnering with him on covert ops with. So how much of that goes through the special bank account? There’s also the issue of upcoming leadership transitions. This agreement–and the coming out party it accompanied–happened right in the middle of the leadership transition into Obama’s second term. Hillary signed it as one of her last acts; it was not released before John Kerry’s confirmation hearings. If State holds it further, it will also not be released before Chuck Hagel or John Brennan’s confirmation hearings (and the latter surely knows quite a bit about the development of the TCA; he was even Riyadh Station Chief during the last years of JECOR). It’s clear from the cables on this that CentCom, unsurprisingly, has been centrally involved in this effort. Yet the White House pushed General James Mattis out at CentCom during the week of MbN’s visit; Mattis doesn’t even appear to be on the list of people MbN visited while he was here. In other words, to the extent anything in this agreement would be controversial or raise concerns, I could see why it would make sense to hold the document until after everyone who will execute the next phase of the agreement has been confirmed, which (if you include Mattis’ replacement) will not be until March. Again, State may not have released this yet for very simple bureaucratic reasons. Maybe it’s just withholding this to hide which contractors are getting–or going to get–rich off of this. But I am curious to see how it has changed in the last five years. https://www.emptywheel.net/wp-content/uploads/2016/07/Logo-Web.png 0 0 emptywheel https://www.emptywheel.net/wp-content/uploads/2016/07/Logo-Web.png emptywheel2013-01-28 23:31:352013-01-29 05:50:54Why Is State Waiting to Release the Saudi Technical Cooperation Agreement? And maybe they’re not posting this because they’re thinking they could probably get away with calling it a state secret these days, so what the hey? Somebody testing limits? Who, after all, would have standing? Spend the next four years releasing redacted pages and litigating over FOIA? Very little reason for presuming it’s being withheld in good faith or for legitimate purposes.